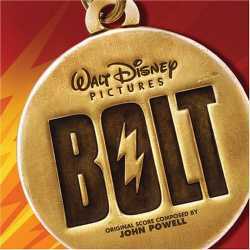 Bolt OST – Winning. Words. Disney’s finest animated feature in a decade? Howl yeah! But what’s this? Not a single ironic ‘Hound Dog’ or ‘Who Let the Dog’s Out?’ in sight? Perhaps a spanner in the wit wheels at the soundtrack-making factory erased all the wink-wink mutt tracks. Distressing when the alternative is Miley Cyrus and John Travolta mounting opening howler ‘I Thought I Lost You’. Luckily it’s composer John Powell to the rescue, his original score comprising 90% of this CD. Generating a pseudo ‘Greatest Hits’ of past work, Powell pumps his Bourne muscles for ‘Bolt Transforms’ and ‘Scooter Chase’ (which wouldn’t sound out of place on a techno dance floor). Elsewhere, he channels Shrek whimsy (‘New York’) and United 93 sincerity (‘House on Wheels’), fostering a varied if not massively original sound. No dog’s dinner, but not quite top musical mutt.